Getting ready for the holiday season? Come and join different fun, wonderful and colorful dance festivals that our country - Philippines can offer. We all know that Pinoy love feasts. For Filipinos, different occasions are always an opportunity to celebrate. 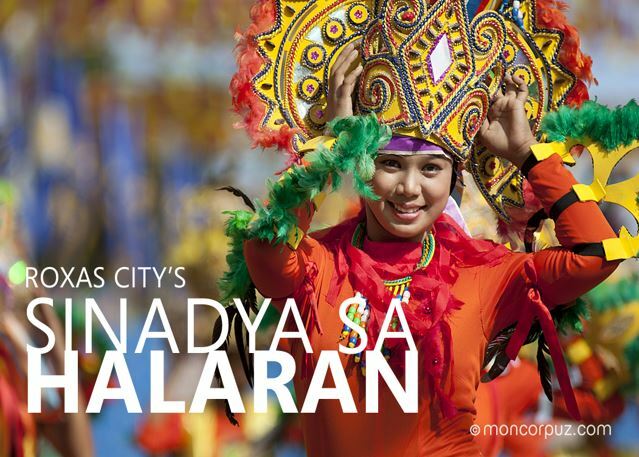 Festivals at all times come with magnificent and one of a kind pinoy dance performances. 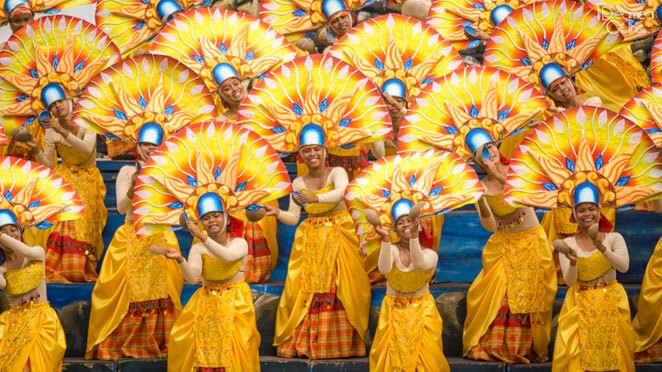 The colorful costumes, props and lively pinoy dance parades are indeed something to look forward to. We have hundreds of festivals all over the country. So, I have listed down some of the remarkable Pinoy Dance Festivals that one must not miss in December. Of course! Our friends – foreign visitors are all welcome! Explore the exceptional beauty and culture of Visayas when you visit Roxas and Capiz City in December! Sinadya sa Halaran Festival is a two merged festivals: Roxas City's Sinadaya (celebration) and Capiz Province' Halaran (offering). It is a celebration of joy in sharing and thanksgiving which showcase the culture thru energetic pinoy dance performances, vibrant costumes, lively parades, fireworks and trade fairs. Spend your holiday off and get a chance to experience the rich culture of Tagbanua Tribe when you visit Palawan in December! Pagdiwata Ritual Festival is an annual thanks giving event celebration of Tagbanua people in Palawan by ritual pinoy dances, food offerings to their deities and souls of departed love ones. Also part of the spiritual ritual is to seek their deities help in healing the sick. So, people who are in serious health conditions also come to join the event hoping to receive miraculous healing. Feel the vibe of exceptional "caroling" version of Bicolanos when you visit Bicol province in December! Bikol Pastores is a unique Christmas celebration – “caroling, Bicol style” in the region. It is a musical re-enactment of the ancient nativity story. Pinoy dance performance is done with an entourage of musikeros playing “Pastores de Belen” - which is one of the first Chrismas carols. Also one interesting part of the festival are the colorful costumes worn by the singers to honor the biblical shepherds who sang the first Christmas carols. You should not miss this festival if you are visiting Ilo-ilo City in December! 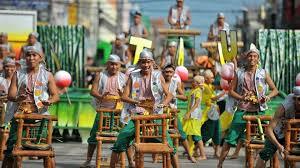 Tultugan Festival is a yearly event that contributes to the evolution of bamboo music and dance in the Philippines. The festival feature competition between tribes wearing costumes highlighting bamboo material and dancing to the beat of bamboo (“Tultugan” indigenous Ilonggo bamboo drum used centuries ago by the natives of Panay to communicate with each other) musical instruments. One of the must see in the festival is the “Gwapo-Gwapa Carabao” whereas carabaos are dressed in fancy costumes. Learn more about Islam culture and check out the amazing showcase of arts and music in Mindanao! 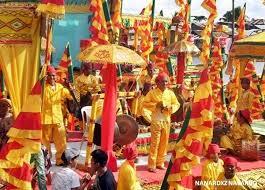 Shariff Kabunsuan Festival is an annual celebration of Islam which display the Muslim religion and culture. It is to honor the arrival of Shariff Kabunsuan via Rio Grande de Mindanao more than 500 years ago to introduce Islam to the natives. The festival feature pinoy street dancing competitions, cultural presentations, battle of the bands and Kanduli (thanksgiving banquent). Must see event when you visit Antique in December! Binirayan Festival started in 1974. It is a month long celebration of Antique Province every month of December and includes street pinoy dancing, culturals shows, colorful parades and arts & crafts exhibitions. It also commemorates the Antiqueños roots which are the Malays and Atis. Do you want to learn more about Pinoy Dance and culture? Come on and explore the beauty and revolution of Pinoy Dance. Step into our domain and check out other related articles featuring the rich culture and history of pinoy dance and pinoy dance festivals.